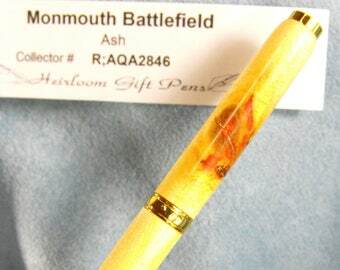 This is registered pen number K;AQA2870, I made it from a fallen branch of The Benjamin Rush Oak planted at the head of the final resting place of Founding Father Dr. Benjamin Rush at Philadelphia’s historic Christ Church Burial Ground. 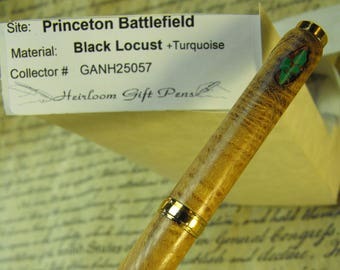 The tree is located at 39°57'6.71"N 75° 8'51.69"W.
This pen comes from an oak planted over the grave of Dr. Benjamin Rush by the Women's Temperance Society, at Christ Church Burial Ground in Philadelphia Pennsylvania, the final resting place of 5 signers of The Declaration Of Independence including Benjamin Franklin. 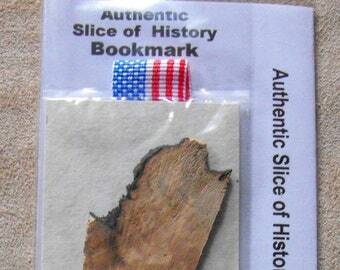 Hold some history in your hand or pass it on to friends and family. Students, teachers, Medical professionals, and enthusiasts of American, English, and Pennsylvania history. DAR and SAR members as well as all descendants of those interred there. Faculty, staff and alumni of Dickinson College, and University of Pennsylvania, also members of the American Psychiatric Association. Government workers and politicians. Members of the military. Anyone who appreciates the unique, or just simple beauty. And of course Philadelphians. 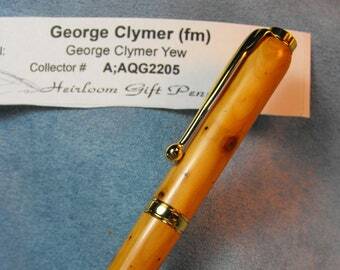 Generally, a light beige with darker stripes and a dark knot in the top. 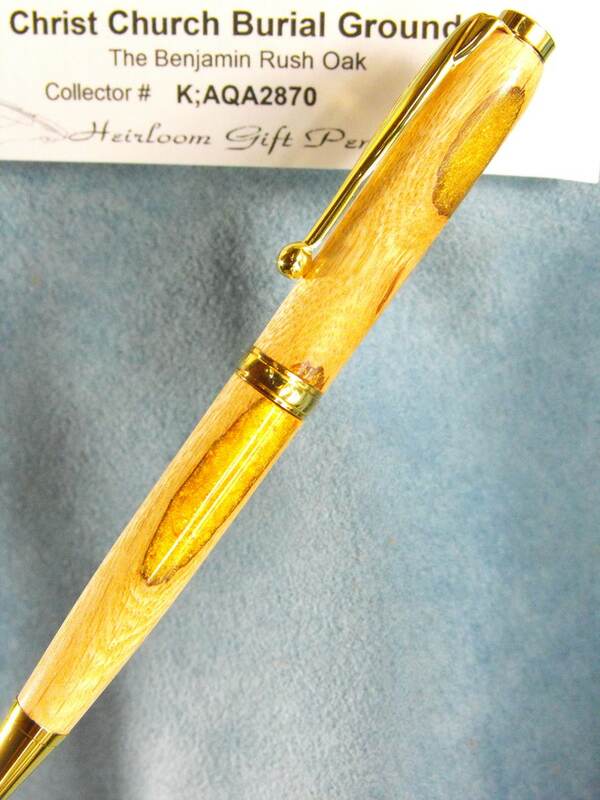 I made this pen from a small branch and you can see the bark of the branch around the edge of the gold flake acrylic I used to fill in the depressions at those spots. 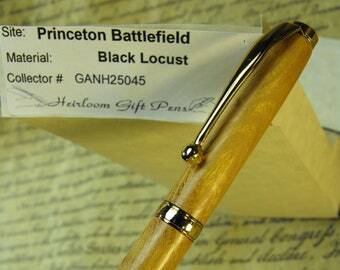 I used this custom-made acrylic to fill in other voids in this pen. It is a twist action Ball Point pen that uses a Cross refill, available at any stationary in broad, medium and fine points and three colors. 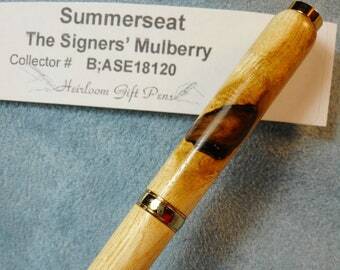 The metal finish is a sealed 24kt gold. 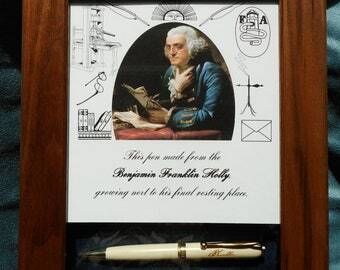 Each pen comes mounted on a handmade pen pillow in a box suitable for gift giving and display (gold with a clear top) and a parchment paper pamphlet giving a history of Founding Father Dr. Benjamin Rush. 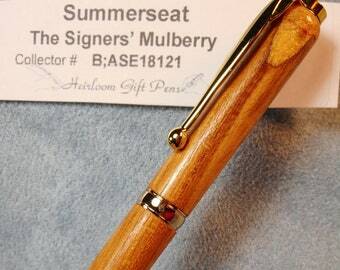 I also include a signed warrant of authenticity on a card with pictures of this pen and a place for each successive owner to sign and record provenance throughout this pens history. 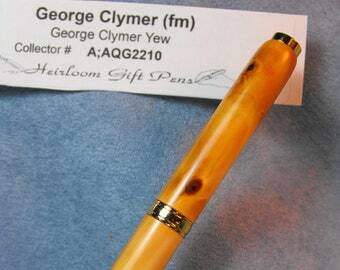 These pens are meant to be used, but they are also meant to be collectable and passed on to succeeding generations or among friends. Therefore each is given a unique, recorded collectors number. Along with the number I keep 4 high resolution photos for future authentication identification if needed. 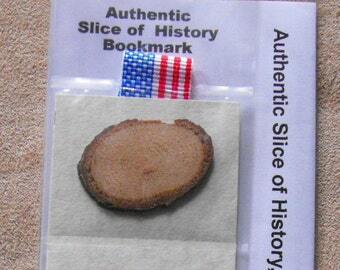 These pictures are also sent along with the pen on the accompanying authentication and continuing provenance card. 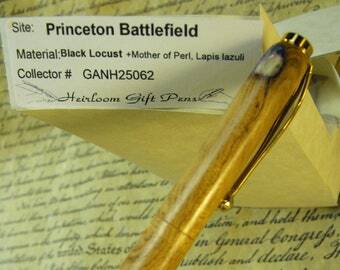 The continuing provenance card is there for each successive owner to sign and give this pen a family history of its own over the years. 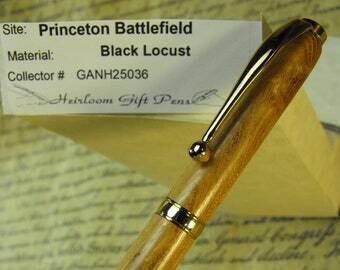 So if you are giving this pen as a gift you should sign the first slot to start its history trail. Christ Church Burial Ground is the final resting place for many patriots, war heroes, and dignitaries, with leaders and pioneers in many fields of endeavor. Among them Dr. Benjamin Rush. A prominent Philadelphia physician, Benjamin Rush was also a Pennsylvania representative in the Continental Congress and a signer of the Declaration of Independence, he served as Surgeon General in the Continental army, and was a professor of chemistry, medical theory, and clinical practice at the University of Pennsylvania and founder of Dickinson College in Carlisle, Pennsylvania. At 15, he completed a five-year program earning him a Bachelor of Arts degree at the College of New Jersey (now Princeton University). From 1761-1766 he apprenticed under Dr. John Redman in Philadelphia. Dr. Redman encouraged him to further his studies at the University of Edinburgh in Scotland. There he earned his medical degree in 1768. While in Great Britain, practicing medicine, he learned French, Italian, and Spanish. Returning to Philadelphia in 1769 (age 24), Dr. Rush opened a medical practice and became Professor of Chemistry at the College of Philadelphia (now the University of Pennsylvania). He published the first American textbook on chemistry, several volumes on medical student education, and wrote influential patriotic essays. He was active in the Sons of Liberty and was elected to attend the provincial conference to send delegates to the Continental Congress. There he was appointed to represent Pennsylvania at the Continental Congress and was a signer of the Declaration of Independence. He was consulted by Thomas Paine on the writing of the profoundly influential pro-independence pamphlet Common Sense. On January 11, 1776, Rush married Julia Stockton (1759–1848), daughter of Richard Stockton, another signer of the Declaration of Independence, and his wife Annis Boudinot Stockton. Benjamin and Julia had 13 children, 9 of whom survived their first year. 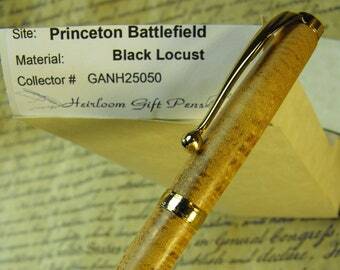 In 1777 he became surgeon-general of the middle department of the Continental Army. Early in the War, Rush suggested the removal of General George Washington (voicing widely held misgivings). It was suspected that Rush was part of a secret plot nicknamed the Conway Cabal to replace Washington with Horatio Gates as commander-in-chief. Conflicts with the Army Medical service, specifically with Dr. William Shippen, Jr., led to Rush's resignation in 1778. Though Rush was implicated in the conspiracy, "it may be safely claimed that conspiracy and intrigue would have been wholly out of character. If he was opinionated and impetuous, he was also incorruptible." Rush later expressed regret for his actions against Washington. In a letter to John Adams in 1812, Rush wrote, "He [Washington] was the highly favored instrument whose patriotism and name contributed greatly to the establishment of the independence of the United States." In 1783 he was appointed to the staff of Pennsylvania Hospital, of which he remained a member until his death. Although anatomy was well understood in Dr. Rush's time, the causes of disease remained elusive. Doctors therefore relied on various unscientific treatments. Although Dr. Rush continued these practices, he actively sought new explanations and new approaches to treatment, some of which remain influential. Dr. Rush wrote a descriptive account of the yellow fever epidemic that struck Philadelphia in 1793 (during which he treated up to 120 patients per day), and what is considered to be the first case report on dengue fever (published in 1789 on a case from 1780). Dr. Rush was a proponent of bloodletting and calomel therapy, treatments that were widespread in America at the time. In his report on the Philadelphia Yellow Fever Epidemic of 1793, he wrote: “I have found bleeding to be useful, not only in cases where the pulse was full and quick, but where it was slow and tense. I have bled twice in many, and in one acute case four times, with the happiest effect. I consider intrepidity in the use of the lancet, at present, to be necessary, as it is in the use of mercury and jalap, in this insidious and ferocious disease.” Some contemporaries, notably William Cobbett, objected to Rush's extreme use of bloodletting. Cobbett accused Rush of killing more patients than he had saved. Dr. Rush sued Cobbett for libel, winning a judgment of $500. Dr.Rush became Professor of medical theory and clinical practice at the University of Pennsylvania in 1791.
fifty dozen of Dr. Rush's Bilious Pills, laxatives containing more than 50% mercury, which the corps called "thunderclappers". Their meat-rich diet and lack of clean water during the expedition gave the men cause to use them frequently. Though their efficacy is questionable, their high mercury content provided an excellent tracer by which archaeologists have been able to track the corps' actual route to the Pacific. In 1766 when Rush set out for his studies in Edinburgh, he was outraged by the sight of 100 slave ships in Liverpool harbor. As a prominent Presbyterian doctor and professor of chemistry in Philadelphia, he provided a bold and respected voice against the slave trade that could not be ignored.The highlight of his involvement in abolishing slavery might be the pamphlet he wrote that appeared in Philadelphia, Boston, and New York in 1773 entitled "An Address to the Inhabitants of the British Settlements in America, upon Slave-Keeping." In this first of his many attacks on the social evils of his day, he not only assailed the slave trade, but the entire institution of slavery. Despite his public condemnations of slavery, Dr. Rush purchased a slave named William Grubber in 1776. To the consternation of many, Dr. Rush still owned Grubber when he joined the Pennsylvania Abolition Society in 1784. He was elected to the Pennsylvania convention which adopted the Federal constitution and was appointed treasurer of the U.S. Mint, serving from 1797-1813. He was founder of the private liberal arts college Dickinson College, in Carlisle, Pennsylvania. In 1794, he was elected a foreign member of the Royal Swedish Academy of Sciences. He helped reconcile the friendship of Thomas Jefferson and John Adams by encouraging the two former Presidents to resume writing to each other in 1812. Rush was a founding member of the Philadelphia Society for Alleviating the Miseries of Public Prisons, known today as the Pennsylvania Prison Society, which greatly influenced the construction of Eastern State Penitentiary in Philadelphia. Rush is considered the "Father of American Psychiatry", publishing the first textbook on the subject in the United States, Medical Inquiries and Observations upon the Diseases of the Mind (1812). He undertook to classify different forms of mental illness and to theorize as to their causes and possible cures.After seeing mental patients in appalling conditions in the Pennsylvania Hospital, Rush led a successful campaign in 1792 for the state to build a separate mental ward where the patients could be kept in more humane conditions. In honor of his service to mental health, the American Psychiatric Association uses his image as part of their seal. Rush is sometimes considered a pioneer of occupational therapy particularly as it pertains to the institutionalized. Rush pioneered the therapeutic approach to addiction. Prior to his work, drunkenness was viewed as being sinful and a matter of choice. He developed the concept of alcoholism as a form of medical disease and believed that the alcoholic loses control over himself. He identified the properties of alcohol, rather than the alcoholic's choice, as the causal agent. During his career, he educated over 3000 medical students, and several of these established Rush Medical College (Chicago) in his honor after his death.